I'll be spending more time in Virginia than I'd like to, so look for some reviews of Arlington restaurants coming soon. 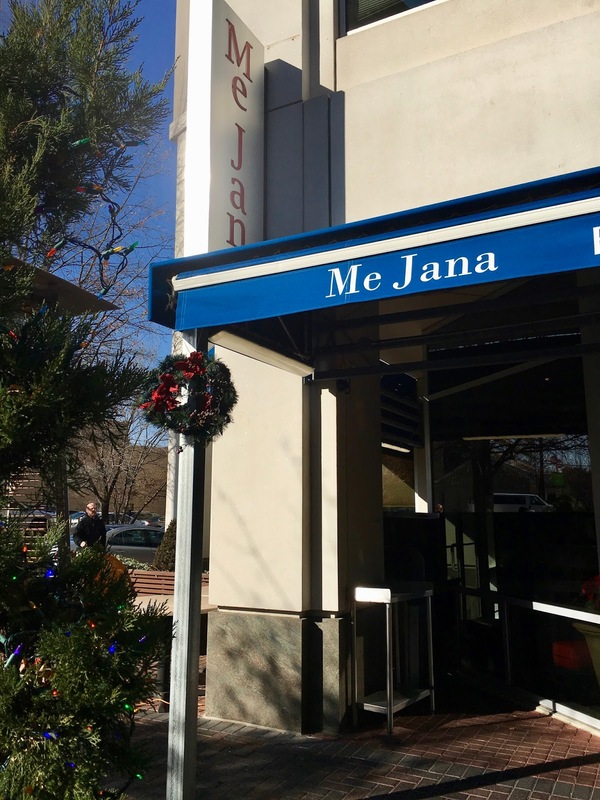 Before I explore any new restaurants, I wanted to go back to Me Jana, a Lebanese restaurant in the Courthouse area of Arlington that I enjoyed eating at once before. On this particular visit, I brought some colleagues here for a nice, casual lunch. Their menu now has items clearly marked as "vegan" so I was excited about that! Because when it states it is vegan, then it must be vegan, right? Well, hold on. We started with an order of hummus and pita. It was very good. And it was clearly marked as vegan. 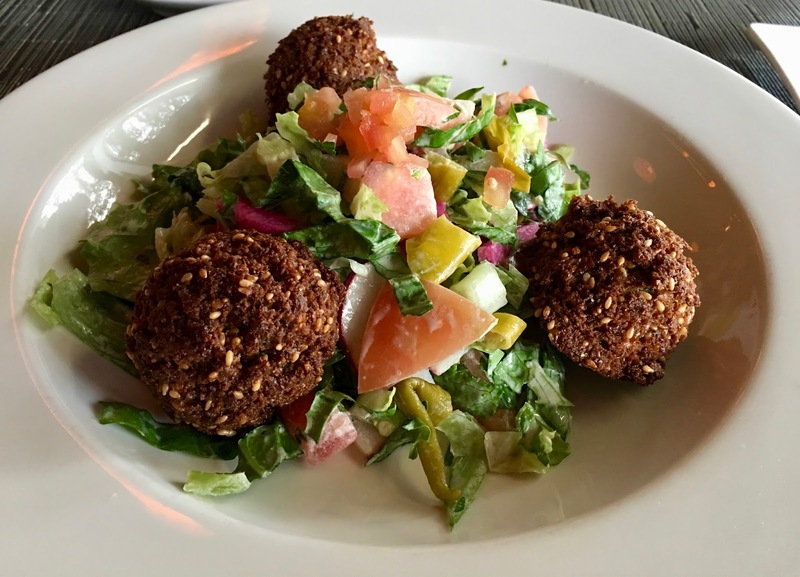 For my entree, I had the falafel salad. Over shredded greens, there were tomatoes, peppers, and three falafel balls. I loved the salad. I will say that the falafel was a little too deep fried for me, but that's not unusual at a Lebanese restaurant. 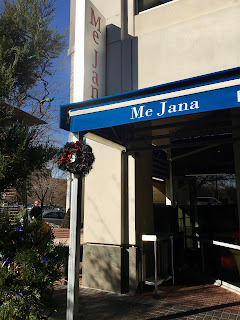 The service was slow even though we were some of the only people there for the weekday lunch, but as it seemed like a solid restaurant, I came back again. This time, I asked if the pita was vegan as we were ordering the "vegan" hummus. The server looked at me confused and said that the pita had milk in it. I then also looked confused as I looked at the menu and remarked that the hummus was listed as vegan. He said that the hummus was vegan, but the pita was not to which I asked if the pita was sold separately. He said it wasn't. Clearly, we didn't understand each other. I told him that you can't mark a dish vegan if the entire dish isn't vegan. What if I opened a restaurant and marked a wrap as gluten free because the wrap was gluten free even though it was filled with seitan (gluten). Yeah...no. It was totally unacceptable and he clearly didn't care. At the same time, while we were ordering, the server remarked that he liked my colleague's sweater and proceeded to touch it. She was offended at that and didn't understand why he had to touch it. The whole interaction was just weird. Well, we decided to eat our lunch there anyway. 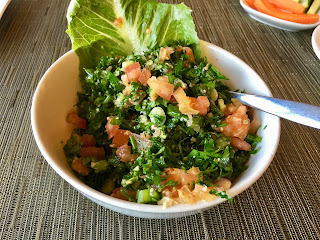 I ordered the tabbouleh, which I figured was safe. When I ordered the tabbouleh, the server asked if I wanted to add salmon or chicken. Um, no. Did we not just have a conversation about how I don't eat animals? My colleagues were appalled and I was ready to leave. We reluctantly finished our meal, but then he wouldn't come back to give us our check. After like 20 minutes, we had to flag him down. Everything about this was wrong. You can't label a meal on a menu as vegan if it isn't. You shouldn't be touching customers. And you should listen to your customers. I do not recommend this restaurant. Do not go here.